#9 will probably be a good cold weather engine as the operator will basically be in the cab. The seat has five height positions from right down on the cab deck to 11" up. When I run it I can sit Indian style down on the deck and will be completely in the cab. If a larger person is running, the seat can be raised to look over the cab roof. 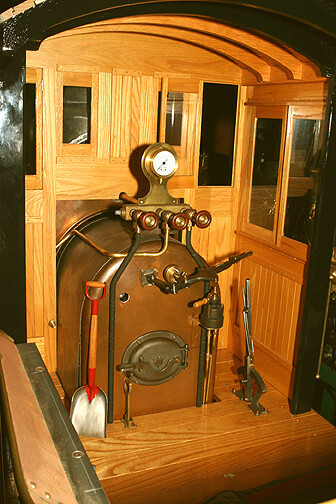 The little angle union valves with the walnut do-nuts for handles, the throttle lever, johnson bar, the fire door, brake valve, and little coal shovel were made from scratch. I made a gaggle of the little shovels and gave them to my narrow gauge friends. Too much fun! 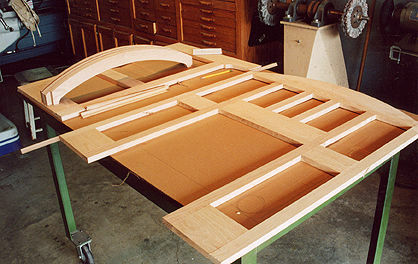 #9's cab is made of oak.